Geographic Range: Winter flounder are found in estuaries, coastal waters, and offshore fishing banks along the Atlantic coast of North America. Winter flounder are most common from New England to New Jersey with smaller populations extending to the Chesapeake Bay. Movement/Migration: Movements inshore and offshore are related to spawning behavior and water temperature. The one exception is Georges Bank where the population does not migrate inshore. adults seasonal movements consist of two phases: an autumn estuarine immigration prior to spawning, and a late spring/summer movement to either deeper, cooler portions of estuaries or to more offshore areas. 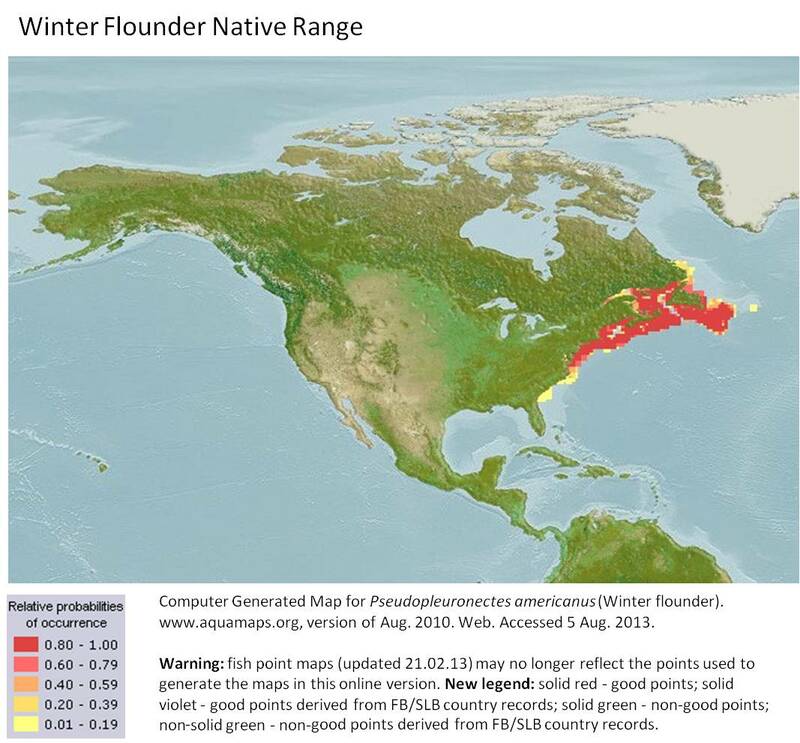 In more southerly regions, winter flounder remain in shallow waters. Spawning: Spawning occurs most commonly in the mouth or mid to outer margin of small rivers, and the middle reaches of larger harbors and rivers where tidal and river currents counterbalance each other to create a retention area for the youngest and most vulnerable larval stages. For southern locales spawning occurs in winter, and for northern locales in spring. Adults tend to return to the same spawning area each year. Habitat Use: Eggs are adhesive and demersal, and have been found in sand, muddy sand, mud and gravel substrates. Eggs and larvae have been found in areas where water flow is restricted. 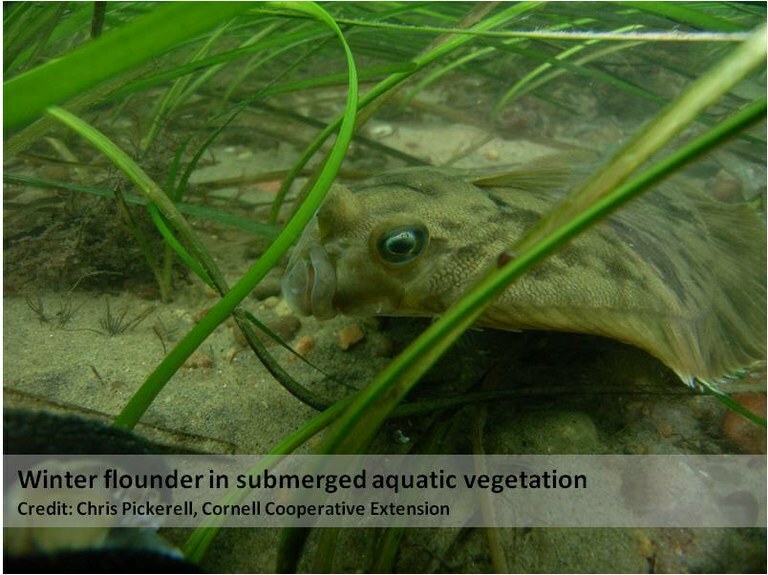 As winter flounder larvae metamorphose to benthic juveniles, preferred habitat appears to shift from the retention areas to more protected reaches either up river or embayments in the lower estuary. Nursery habitat for larvae and juveniles includes littoral and sublittoral saltwater coves, coastal salt ponds, estuaries, and protected embayments. Juveniles rely on several different substrate types, such as mud bottoms, mud/shell-litter, and sandy substrate. Vegetated habitat, including submerged aquatic vegetation and macroalgal beds also provide important nursery habitat for juveniles. Substrate choice likely varies depending on other factors such as temperature, dissolved oxygen, and food availability. Reported spawning substrates include sand, silty sand, mud, and gravel. Text taken from Winter Flounder Habitat Fact Sheet. Atlantic States Marine Fisheries Commission, 2008. Eelgrass meadows support complex trophic food webs and provide habitat for the forage, shelter and juvenile development of fisheries species. However, this habitat is declining in part due to damage from boating infrastructure. Traditional mooring chains drag on the seafloor, causing direct scour of eelgrass plants and degradation to the quality and function of eelgrass beds through increased turbidity. The project will restore eelgrass (Zostera marina), by replacing traditional moorings with elastic conservation moorings that minimize impacts to the seafloor by preventing chain drag. Project text provided in part by Massachusetts Division of Marine Fisheries. Project text provided by the South Carolina Department of Natural Resources. This project will build intertidal shorelines with oyster reefs. This project will create and protect intertidal oyster reefs and saltmarsh, essential fish habitat, within the Ashepoo-Combahee-Edisto (ACE) Basin National Estuarine Research Reserve in South Carolina. Organization: South Carolina Department of Natural Resources. When they first hatch, winter flounder are like most other fish, with an eye on both sides of the head; however, as they develop, the left eye will migrate across the top of its head to the right side of its head. The fish then lays flat on the sea floor and will have both eyes facing upwards. Since both eyes are on the right side of the body, the winter flounder is called a right-eyed flatfish. Unlike most fish that spawn in nearshore waters during the spring, the winter flounder comes inshore to spawn during the winter. In order to survive the shallow waters during the winter, the flounder produces a specialized anti-freeze protein in their body. Text taken from Winter Flounder. New York State Department of Environmental Conservation, 2013. www.dec.ny.gov/animals/36192.html. Web. accessed 5 Aug. 2013.